I’d like to start this post out for custom Dri Fit tshirts in St. Louis with a little education. Many people ask for Dri-Fit shirts much like people ask for Kleenex when they mean facial tissue. The word Dri-Fit is a proprietary term used by Nike and their moisture wicking technology. As I said above referring to a performance or tech t-shirt by the name Dri-Fit is the same thing as asking for a facial tissue by asking for a Kleenex. It’s a trade marked and or copyright term owned by these companies. We know what you mean but if you are asking for Dri-Fit shirts you are really asking for a Nike shirt. So in terms of what customers are really looking for, performance or tech shirts would be the right connotation. So if you are in the market for this type of shirt there are several brands that carry a tech shirt or performance shirt. The important part here in wanting these shirts is to understand that they are made up solely of 100% polyester, light weight, and of course, in recent years very trendy and very much the go to shirt where perspiring is going to happen. Many brands that offer these shirts in a variety of styles and colors have affordable options to screen printing your custom logo onto them. We print performance shirts for a lot of team sports be it summer sports camps, team t-shirts during the season, or even as 3rd jerseys in some instances. Little league and youth sports have gotten away from the cotton tees and replaced them with the performance t-shirt. Since their popularity has gained their prices have come down making them affordable option. And it’s not just t-shirts. Custom Dri Fit tshirts in St. Louis can be shorts, hoodies, long sleeve tees, and most styles even come in a ladies cut. 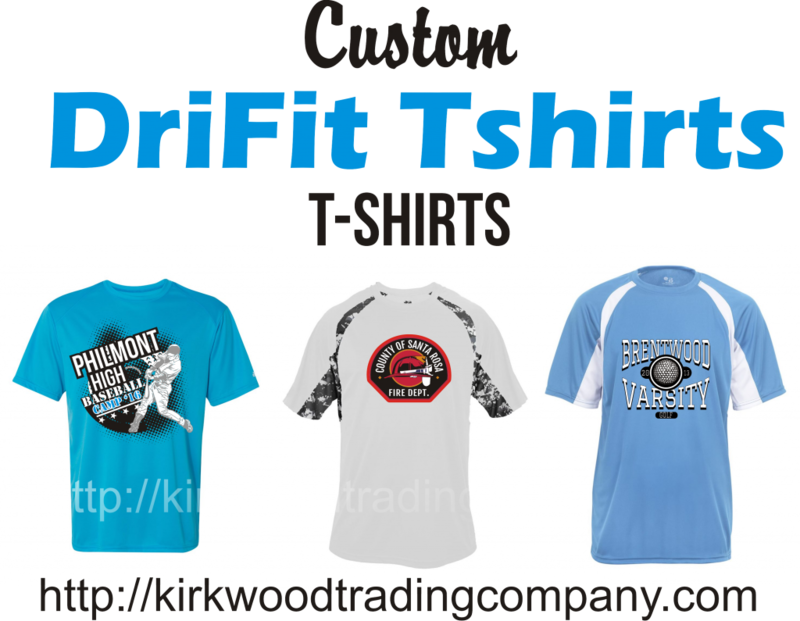 Contacting Kirkwood Trading Company the next time you are in the market for custom dri fit tshirts in St. Louis and we’ll be happy to show you options and best practices for printing on performance tees.